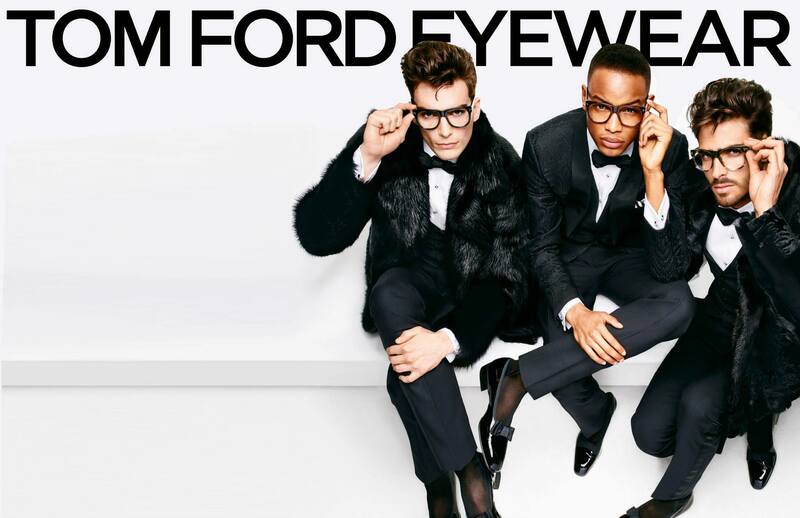 Europtics is pleased to announce the return of Tom Ford eyeglasses and sunglasses to our Cherry Creek North location. Tom Ford has been a fashion legend as the creative director of Gucci and of Yves St. Laurent. He started his own brand in 2005 and has taken the world by storm since. 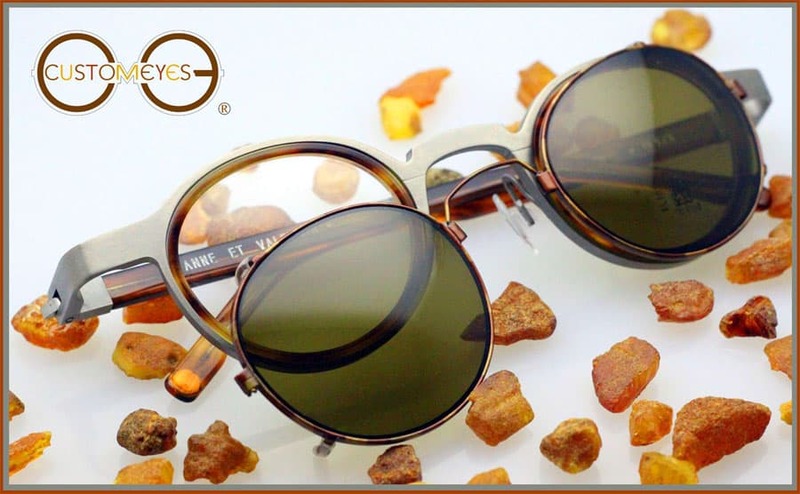 His eyeglasses and sunglasses are bold, fashion forward expressions of individualism while maintaining a well-built everyday construction that makes every pair a valuable addition to any wardrobe. Come down to Europtics Cherry Creek North at 100 Fillmore and try on a pair of Tom Ford eyeglasses or sunglasses and both see and feel the difference yourself. 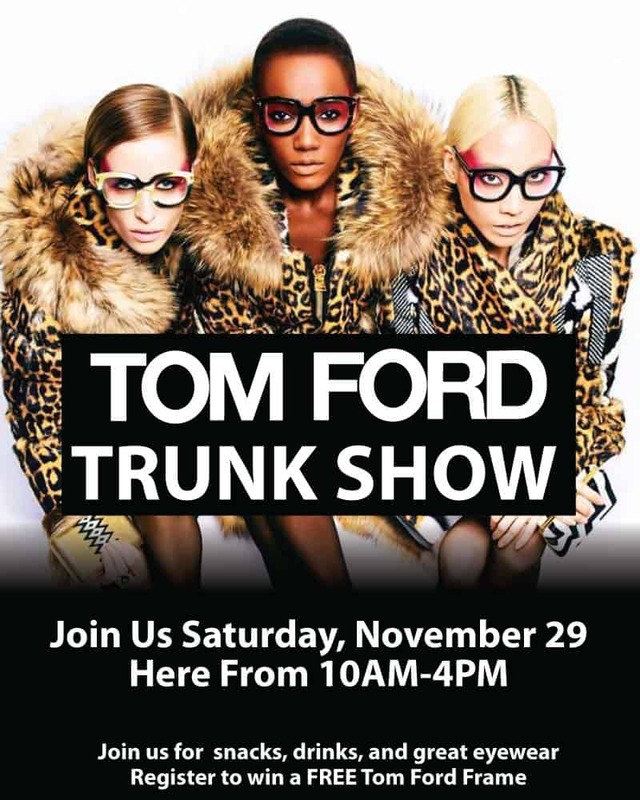 Join us on Saturday, November 29th at Europtics Cherry Creek North, 100 Fillmore St. for the Tom Ford Trunk Show and see the entire line for yourself. How colorblind are you? Most of us suffer some degree of colorblindness, especially as we age. Men suffer from colorblindness at a much higher rate than women. 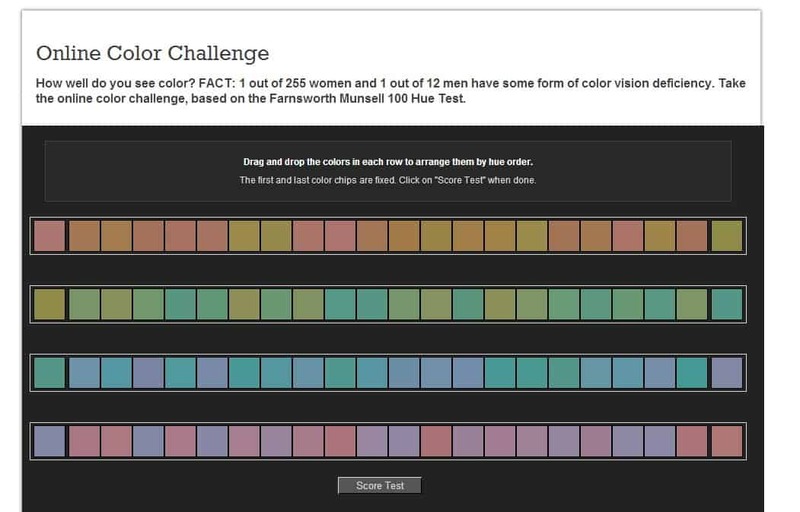 Here is a fun colorblindness test you can take online from your desktop computer. If your score is higher (worse) than you expected, call us to schedule an eye exam and let’s see if we can help you see better and clearer. We’ve been a fan of Maui Jim sunglasses for years. They have always been fun and functional, with some of the best sun optics available anywhere. What they have never been is flashy. Maui Jim just changed all that with their new Silk Crystal collection available now at Europtics Cherry Creek North. Handcrafted in Italy, each pair of Silk Crystal sunglasses are a one-of-a-kind piece featuring artwork by internationally renown Maui artist Charlie Lyon. Each piece is one of a kind, uniquely numbered and sold with a certificate of authenticity. Yet as uniquely individually styled these new Silk Crystal sunglasses are, they come with Maui Jim’s legendary sunglasses lenses. Maui Jim’s PolarizedPlus2 lens technology has received the Seal of Recommendation from The Skin Cancer Foundation as an effective UV protectant because the technology cuts 99.9 percent of glare and eliminates 100 percent of UVA and UVB rays on both sides of each lens. The lenses are recognized as safe and effective sun protection and are an important part of an effective defense program against skin cancers of the eye and eyelids, which is so important here in Colorado. Stop into our Cherry Creek North store today, at 100 Fillmore and see these amazing sunglasses for yourself. Cherry Creek North was the site of the 2014 Celebrate Fashion Night on September 19th and Europtics was asked to help outfit the models with fashions for their face and their eyes. We were proud to present such lines as Mykita, Barton Perreira, and Thierry Lasry as part of this year’s fashion showcase. Here is a video clip from Fox 31 in Denver, KDVR, promoting the event. Most Colorado adults have a pair of sunglasses (unless they are driving east or west during rush hour it seems) we wear when it’s bright out, whether for skiing, golfing, picnicking, or even just looking cool. Most of us however, are failing our children when it comes to protecting their eyes from the damaging UV radiation of sunlight, which affect children under 16 far greater then their parents. At a mile or more above sea level those rays are even more damaging to our children’s eyes. Here is a story and video from The Wall Street Journal which we has your to read over and watch. Europtics carries stylish eyeglasses and sunglasses for children as well as adults. There is plenty of summer left, protect your kids eyes the way you do their skin this summer. We are all about seeing better. Whether that is a regular eye exam, a new pair of eyeglasses or sunglasses, Europtics wants to help you and your family see better. We know a lot of people who get LASIK surgery. We are not Anti-LASIK, but instead smart LASIK. We know a lot of good LASIK surgeons. LASIK is not the answer to all eye problems and isn’t for everyone. Nothing is 100%. Choosing the wrong surgeon can lead to disastrous consequences as this video from The Dr. Oz Show last October will highlight. Here is a YouTube copy of that video and a link to The Dr. Oz website. Our tag line at Europtics is “The Art Of Optics”. It is something we believe in. We think eyewear is much more than a medical device, it is an extension of your personality in the same way a great suit, dress or even a tie is. Just like you, we are sometimes stopped by how great two items come together to make something even more beautiful than each of them separately. This great tortoise clip made for this pair of Anne et Valentine frame gave us pause and we just wanted to share. What art can we make for you? Summer is fast approaching (despite Winter’s latest attempt to stick around) and as the weather warms, we will all spend more time outside. This is a great time to get a new pair of sunglasses for every member of your family. The folks at eyeSmart and the American Academy of Ophthalmology have put together this infographic on being Sun Smart and educating us on the importance of sunwear to protect our eyes. This past weekend, the buyers at Europtics jetted off to New York City for 2014 International Vision Expo at the Jacob Javits Center. For 3 days we looked at thousands of eyeglasses and sunglasses to bring the best fashions, the best colors, and the best designs to our Colorado customers. 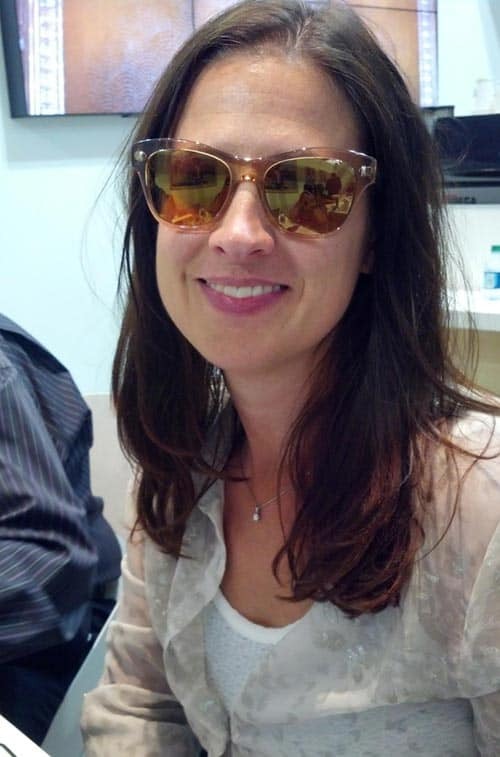 Here is Amy showing off a pair of Oliver Peoples Sofee sunglasses. What do you think?